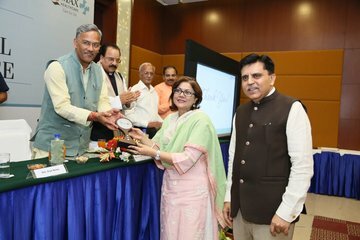 Dr. Sumita Prabhakar was felicitated by Hon’ble Chief Minister of Uttarakhand Shri Trivendra Singh Rawat on 27th May 2018 at Hotel Madhuban, Dehradun during a function organized by Max Healthcare. The award was given in recognition to the outstanding work done by Dr. Sumita Prabhakar in the field of IVF and Gynecology. The award was given by Hon’ble Chief Minister of Uttarakhand Shri Trivendra Singh Rawat in presence of Shri Ajay Bhatt, President (BJP Uttarakhand) and Mr. Rajit Mehta, MD & CEO, Max Healthcare. Dr. Sumita Prabhakar has expressed her gratitude to the organizers and has assured that apart from her service in the field of healthcare, she will be continuing social work endeavors under her Preventive health initiative Can Protect Foundation.